So pretend I can wave a magic wand and make this DLC happen. Can you suggest any Soviet (or Soviet-allied) units that would be good opponents? Any formations unique or special that fought in Romania or south-east Europe? I realize you're a proponent for the Romanians, but maybe you've come across particularly interesting Soviet formations in your research? I didn't studied methodically the Soviet units, just made notes and now I read this book to start research of Soviet units as well. I pointed already this tank regiments, I think it is hard to find something more unique than a Communist regiment raised with the help of an American archbishop I would very much like to play with this unit as it was mainly recruited from Armenian ethnics and I grew up along a family of Armenians refugees in Romanian from Turkey and I hold dear this people considering my childhood experience with them. I think unique would be the Soviet Naval Infantry. If you look at this map there was a landing made in order to encircle the right wing of Romanian 3rd Army. The Romanian 10th Infantry and its forward detachment 100th Brigade which I posted previously in this thread. The same day the Soviet 46th Army made an amphibious landing with 8000 troops against the III Corps’ 110th Infantry Brigade on its coastal right flank. Despite a desperate counterattack by a regiment, the Soviets had taken Akkerman by the late evening. The III Corps was now under threat of being surrounded and cut off, withdrawal had become essential. This would be an interesting operation campaign wise, in a combined urban and lagoon environment. See here and here how's the terrain in the respective area. Romanian units encountered Soviet Marines constantly during the war, starting from 1941, continuing to Odessa battler and in Crimeea and Kuban and their assessment was that not only these units were not only very well trained and equipped but also very motivated ideologically. Compared with other Soviet infantry units, their main weapon was SVT-40 which was difficult to maintain thus prone to jamming which was not the case with well trained Soviet Naval Infantry. 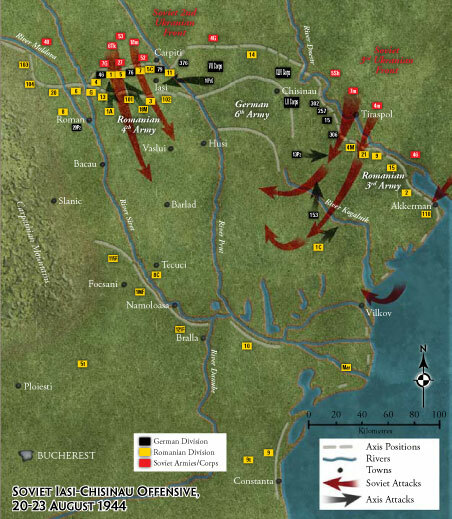 There are also Guards Airborne divisions involved in the attack of the 2nd Ukrainian front, the Northern thrust like 6th Guards Airborne which was tasked with taking the important position from Targu Frumos which was so bitterly fought for in the spring failed Soviet offensive. Here is a nice re-enactment group of this unit. Other interesting units I stumbled upon are 49th Guards Rifles, 4th Guards Motor Rifles and from armored/mechanized formations there were the new type Mechanized Corps which was to become the main operational mechanized formation for the remainder of the war. They were about the same size as a German Panzer division, and designed as a true combined-arms formation with a good balance of armor, infantry, and artillery. Mechanized corps were not to be used in breakthrough battles, but only in the exploitation phase of an operation. Here you can find the memoirs of Dimitry Loza, Hero of Soviet Union which was officer in one of these corps equipped with Shermans during Jassy-Khisinev second offensive. Here is an interview with him. There were also Tank armies, Shock Armies, Guards Cavalry Corps, Guards Rifles Corps so I think there are plenty of units to pick for. Basically all types of armor and tanks were involved in this battle and IS-2 was for example for the first time deployed in Moldova, during first Jassy-Khisinev first battle (Romania captured one working IS-2). I will also search for unique Soviet units methodically, this is just an overview of what I stumbled upon until now without a serious research. It's not easy because my access to Russian sources is limited because I don't know the language but I'll got there eventually. Last edited by steppewolf on Mon 4 Feb 2019 22:45, edited 1 time in total. steppewolf wrote: I didn't studied methodically the Soviet units, just made notes and now I read this book to start research of Soviet units as well. I pointed already this t[url]ank regiments[/url], I think it is hard to find something more unique than a Communist regiment raised with the help of an American archbishop I would very much like to play with this unit as it was mainly recruited from Armenian ethnics and I grew up along a family of Armenians refugees in Romanian from Turkey and I hold dear this people considering my childhood experience with them. I didn't touched until now Airplanes available to Romania except some reference in 1st Armored division of potential planes. Romania can field two unique planes, locally built. First one is the IAR - 80/81 fighter/fighter bomber, an entirely Romanian design. in game this plane may be the bread and butter of Romanian Royal Air Force (Fortele Aeriene Regale Romane - FARR). Even if it has more modern planes like Me-109G (also assembled locally), Ju-87, Ju-88, Hs-129, the local design can be a cheap and versatile fighter (Vanator) or light bomber (BoPi - Bombardament Picaj which means Dive bomber). It would lack in speed (485 to 510 km/h for fighter and 465 for bomber with 1 x 225 kgs and 2 x 50 kgs) but it was a nimble plane, with good retention of speed which makes up for its lower speed compared with Soviet planes which even if were more rapid could not keep its speed as well as the IAR. Manuverability is good, fire power is comparable with modern aircrafts of its and the cabin has excellent visibility. It is a versatile plane, available in numbers and add quality this way along with a small price and availability. More info and pictures on imgur album. The second local plane was a bomber of Italian origin (SM 79) but heavily modified in Romania which was designated as IAR JRS 79B and B1. Its capabilities were significantly greater than its Italian predecessor, the SM.79, with over 1,850 kW (2,800 hp) available and a low wing loading that gave it characteristics not dissimilar to a large fighter. 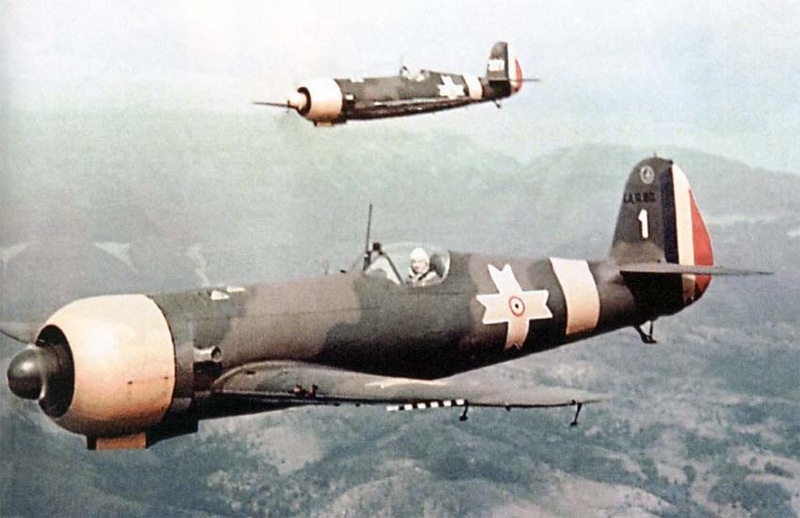 Other than these two local designs, Romania used in numbers Bf-109G (even assembled some), Ju-87 Stuka D3 and D5, Hs-129B-2, He-111H and Ju-88A-4. A recon/liaison local plane was also widely used,IAR-37/38/39. This plane was used by famous Medevac unit Escadrila Alba (White Squadron) made of women pilots. “The White Squadron”, a nickname disputed by several authors, which, in fact, belongs to the Italian journalist Curzio Malaparte, the author of the book “Coup d'état: the technique of revolution”. While he was researching on the Romanian front, he was inspired by the color of the Polish aircraft, originally painted white, with the red cross on the fuselage and the wings, which is why soon enough they have earned the reputation of air ambulances. I think Steel Armor series should change to a real simulator bringing more options. A powerfully mission editor is really needed. New Maps, and new tanks for WWII should come like new DLC as a buy option. steppewolf wrote: I didn't touched until now Airplanes available to Romania except some reference in 1st Armored division of potential planes. Marvinroata wrote: I think Steel Armor series should change to a real simulator bringing more options. A powerfully mission editor is really needed. New Maps, and new tanks for WWII should come like new DLC as a buy option. A mission editor would be huge for this game's longevity. I cannot see your avatar Henrymep.